Giving your pet quality post-operative care to ensure their best recovery. Creating personalized care plans for each furry family member! Individualized attention and compassion for your furry friend. We strive to provide quality therapies for our patients. Learn more about all the services we provide. At Pawsitive Strides, a Des Moines Veterinary Rehabilitation & Therapy Center, we are animal lovers through and through! Your pet is our highest priority, whether we are providing post-operative therapy or starting a treatment to improve your pet's overall quality of life. We will treat them as if we were their guardian pet parent. At Pawsitive Strides, our team will spend the time. You will be an integral part of the development of your pet's care and therapy plan, ensuring a cooperative effort between yourself and the care team! 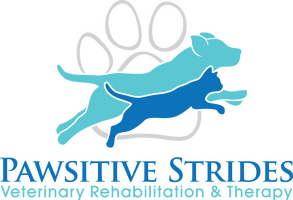 Our goal at Pawsitive Strides Veterinary Rehabilitation & Therapy is to alleviate pain and restore our patients to maximal function, improving their quality of life. ""..With each visit with Dr. Peterson and her staff, Bandit was reevaluated. His treatments and exercises were adjusted to insure continued progress. Within 3 weeks Bandit was walking, not normally but was mobile on his own. Within 5 weeks Bandit was 90% back to normal: walking, running, jumping and playing...""